Smoothies are a good addition to anyone’s diet, and many people have fallen in love with their delicious taste and added health benefits. From sweet treats to green smoothies, there are a variety of blends you can try and here are a few easy to make smoothies to add to your breakfast. Cherries are a staple for summer fruit lovers, and when mixed with some vanilla, protein powder and coconut, they make a delicious smoothie that is packed with many health benefits that include helping with insomnia. Many people crave chocolate smoothies but are not always aware of the high levels of sugar they contain. This smoothie is perfect for not only satisfying your chocolate cravings without overloading you with sugar but the mixture of cocoa powder, blueberries, and bananas provide added benefits that include healthy brain function. You can mix some delicious pineapple with some yogurt to fresh spring water to make a sweet but healthy smoothie that is perfect for a relaxing day by the pool. Strawberries are natural antioxidants and when blended together with bananas, provide a nutrient packed delicious smoothie that also satisfies your sweet tooth. Mix watermelon, coconut water, and a few leaves of basil to create a smoothie that will keep you well hydrated during the summer months. Cantaloupe, when mixed with whey protein powder and cottage cheese, will fuel your body with protein necessary to build and repair your muscles as well as fight off illness and infections. All you need for this smoothie is a mixture of 2 tbsps. of peanut butter, a few sliced apples, a banana, and some crushed ice for a protein packed, delicious smoothie. Yogurt is added to quite a lot of smoothies, and when mixed with fresh fruits, it makes for a delicious smoothie that is packed with probiotics for healthy digestion, as well as useful nutrients such as vitamins that promote a healthy immune system. For an antioxidant-filled smoothie that also satisfies your sweet tooth the healthy and natural way, you can try a strawberry smoothie that is mixed with vanilla or butter extract. 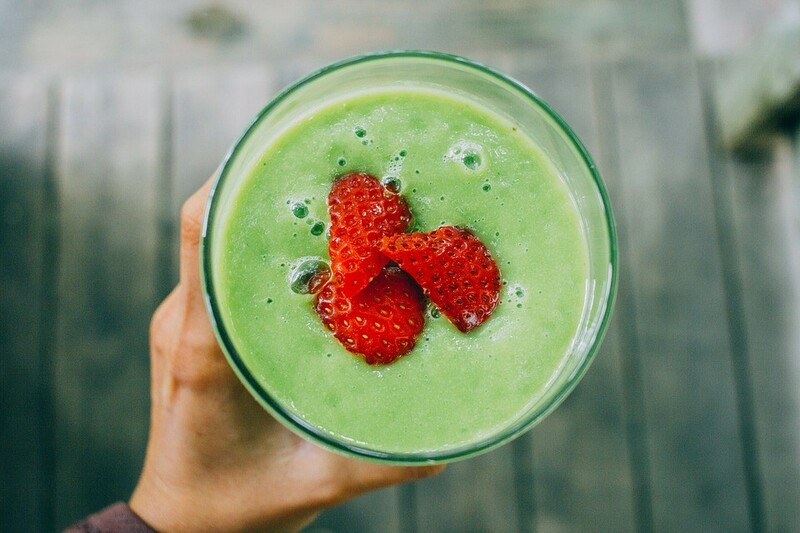 This smoothie contains a large portion of green vegetables like spinach along with sweet additions such as pineapples and coconut to satisfy your appetite in addition to providing many added health benefits. There are many other easy to use recipes for smoothies, and each can be modified to suit your tastes and specific needs. Smoothies are fairly simple to make, and all you need are a few, relatively easy to work with ingredients that are rich in valuable nutrients and deliver on flavor. It is important to remember not to add too many sugary or processed products as they can diminish the nutrient and health value of your drink. How about you, what’s your favorite breakfast smoothie?